Tired of having the usual design of your home? Why not switch things up and inject a dose of personality to your humble abode. You can achieve this by shedding an adequate amount of light to brighten up the corners of your household with the help of sunrooms offered by Pacific Builders. With the said company’s functional and high-quality sunrooms, rest assured that your home will have that radiant and engaging appeal you have been planning to accomplish. When it comes to Pacific Builders, the said company has been providing high quality products, sunrooms in particular, to its customers for decades. From 1947 up to the present, it has stood forth in providing not only exceptional products but also utmost customer care and service. Aside from that, Pacific Builders has superior engineering and advanced techniques that are utilized in manufacturing its products; therefore, optimum product quality is continuously observed. As of today, Pacific Builders is a dynamic force in the industry that never fails to guarantee satisfaction to its well-valued customers. Among all the multitude of products showcased by Pacific Builders, let us put the spotlight on its sunroom product line. Talking about the sunroom, also known as sun lounge, sun parlor, or sun porch, this type of structure is constructed at the side of a house most of the time. With this structure being built, it gives you the opportunity to admire the beauty of your home’s surroundings while being safely enclosed and safeguarded against the rain, wind, and other harsh elements during extreme weather conditions. Sunrooms may come in a diverse variety of design types. They can be made out of different raw materials as well. If you opt to achieve a rustic look, then you can have a sunroom composed of bricks. Another option would be sunrooms that consist of glass if the outdoor view is your main priority. If warmth and coziness are your primary concerns, then wooden sunrooms are perfect for you. 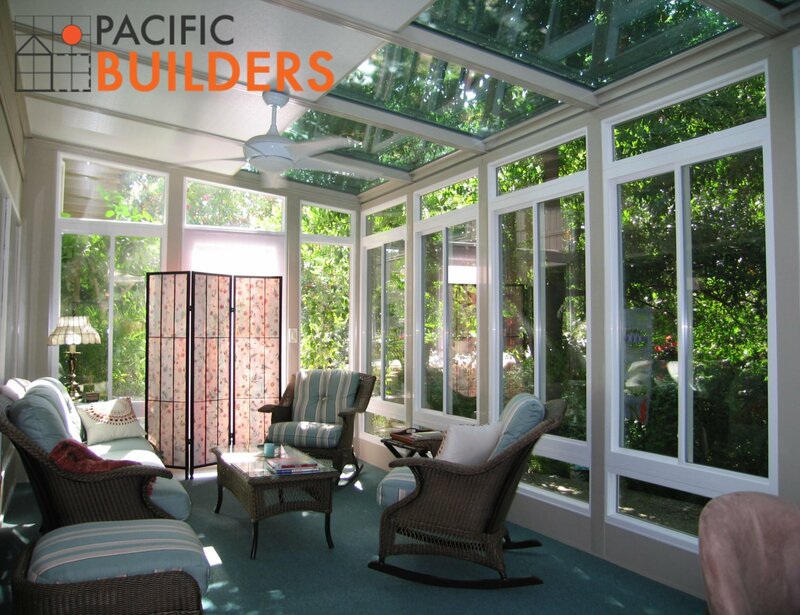 Apart from the sunrooms themselves, Pacific Builders also provides some tips on how to maximize the aesthetic appeal of these sunrooms in order to perfectly match with the existing features and surroundings of your home. For a sunroom to look more natural, add some indoor plants and flowers in it. Doing this also creates a strong visual connection between the outdoor surroundings and your home. To take advantage of the natural light and the outside view, position the tables against the window area of the sunroom. In addition, emphasize the brightness of the sunroom by painting the walls in white color. Also, it would be a clever idea if the sunroom has direct access to your terrace. In terms of artificial lighting, it is not of important regard since natural sunlight serves as the main source of illumination during the day. During nighttime, it is best to use a pendant light or wall-mounted lights so as to have a more cozy and comfortable ambiance.